In the lead up to the Lunar New Year or Chinese New Year, its not uncommon to see Chinoiserie popping up everywhere. I contemplated pouring myself into a cheong sam this year, but decided not to because I knew it’d only ever see the light of day once – on the 1st day of the New Year and thereafter it’d languish at the back of the closet as a “Why on earth did I buy that?” purchase. 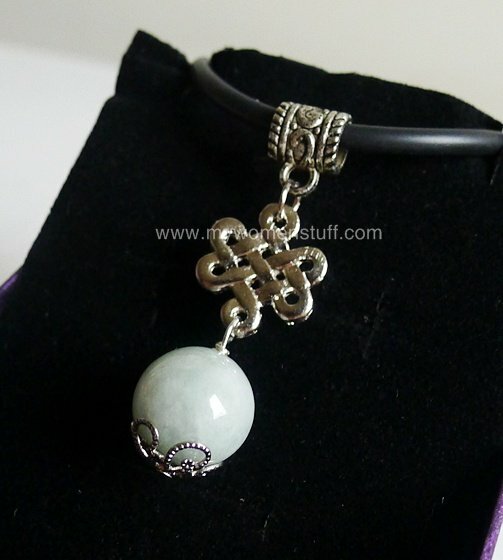 Not wanting to be left out of the Chinoiserie race, I picked up instead a necklace with a Chinese mystic knot motif! That’s very Chinese! I actually spotted this in the Isetan sale newsletter and I somehow identified with it so I HAD to have it. Actually went to join in the madness of an Isetan sale day just to make sure it wasn’t sold out 😛 I don’t do that very often. 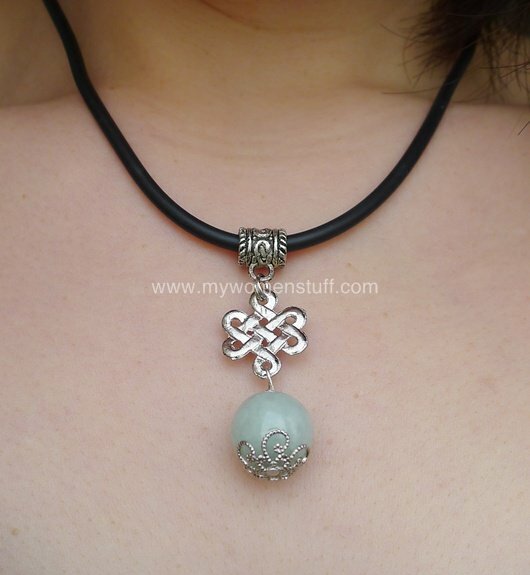 Its a very simple pendant comprising a metal mystic knot and a sphere of pale jade. The necklace came with a black rubberish necklace which makes it look somewhat casual, but I tried putting the pendant on a shiny silver/white gold chain and it really stands out very prettily so that’s an option I have of dressing up the pendant. That’s gorgeous! Unfortunately, CNY is just another work day in Australia, so nothing special for me. Have a great time and lots of delicious food! My bit of Chinoiserie for this year is a cotton cheongsam! Much less formal than the usual silk/satin ones, and not to mention more comfortable and bearable to wear as well 😛 So I don’t have to worry that it would just be worn once. For you maybe! I still have 1 more day! Haha gotta get that bit of red for CNY right? I don’t think I have anything red this year. How odd. bought a summerset dress but haven’t bought any shoes…..omg……. Our family is making the CNY offerings and going to temples and stuff. Otherwise, I don’t really do any Chinoiserie shopping (or maybe I should!). I’ll be waiting for my red envelopes though! Ooh the best part of CNY! 😀 Red packets! I tailored a knee-length lace qipao last year so this year I’m going baby tee and jeans. Though am itching to tailor a cotton qipao for everyday/office wear after this CNY. Good idea of incorporating chinoiserie in jewelery instead of apparel! That’s really pretty PB! I’m always attracted to costume jewelery, but find that my entire collection goes unworn. Must resist buying more! For this year, I bought a Philip Lim dress in MUSTARD. I’m telling myself that it’s GOLD, therefore very CNY. Haha! Mustard is just one of those odd colours that you either love or hate. For some reason I’ve got 2 mustard dresses. Sounds absolutely horrific, but it works. It’s in silk ok???–haha! That’s a lovely piece of necklace. I’ve kept my cny shopping to just clothes this year. No accessories. But I’ve also indulged and bought myself more cosmetics and a Clarisonic! Hoping to have some ‘me’ time during this cny. But think it’s a bit difficult. Thanks Lisa and a Clarisonic! Good to keep good care of your skin 🙂 I know what you mean about not having me time during CNY. Its always such a hive of activity isn’t it? I bought a silver toga cheongsam! My very first chinoiserie item!